It is not surprising that 2013 brought another year of double-digit growth in Orlando. Jobs are being created and employment levels are rising as a result. Property markets are driven first and foremost by the people who live and work in a city. 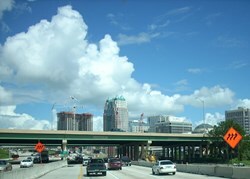 Property prices in Orlando have risen 24% in 2013 making it one of the fastest growing cities in the USA. Much of the growth is driven by low interest rates and domestic demand for homes. The economy is also improving and Fitch the ratings agency affirmed its stable 'A-' rating on Orlando, Florida Community Redevelopment Agency bonds.